This is our first New Moon of the Autumn season here in the Northern Hemisphere, but we are all being provided with a huge opportunity for transformation. 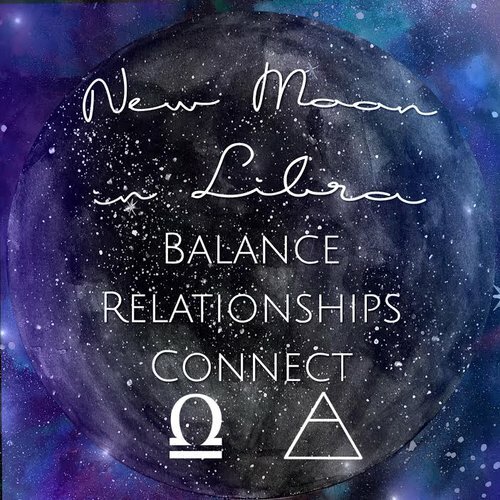 Libra energy is all about balance, fairness and connection, but this particular New moon is a special one, as Libra’s ruling planet Venus is currently Retrograde in Scorpio. This has only happened twice in the last 50 years and holds strong karmic energy with the ability to transform your life by ending old cycles that no longer serve you and allowing you to step into your full potential. Scorpio is the house of transformation, depth and rebirth. It’s a watery, emotional sign that is governed by feeling rather than seeing. This has potential to be a very emotionally intense time for us all. But don’t run from your emotions! But we have to go deep first. This is a month of digging deep and unearthing the keys to our transformation. Honor what you find. So, Grab a cup of hot coffee and read on to see what this New Moon Cycle in Libra has in store for you! This New Moon in Libra is affecting our relationships with just about everything and everyone. We are on the brink of a massive perspective shift on a global level, which means you are likely going through many shifts and changes of your very own. Remember not every relationship is a romantic one. The way we relate to the world around us is changing, and this New Moon in Libra is definitely pushing for that change. Be aware that emotions may feel like they are turned up a notch or 5 during the New Moon. The New Moon is opposite Venus, which increases our desire for love and affection, this could possibly cause some to feel lonely or isolated. The New Moon is also Square Pluto which increases the drama or intensity of our current situation. But it feels like our cries and demands for equality, fairness and common sense are being drowned out by the need for destructive, war-like energy. Venus is currently square Mars, a challenging aspect… because we can SEE the potential out there for our world, but we just can’t seem to reach it. Libra wants balance, but Mars wants war. We can see this on a global scale in our world today. But like any transformation, we must first clear away the old before anything new can grow. There is a need to detox and purge in order to make room for anything new. On a massive scale, this will take time and very likely more of the war-like energy that we see will continue to play out. This is why self love is important. Without it, we could become dependant on the love from others. Standing up for yourself and speaking your truth is continually important these days. Mar is a major influence right now, so draw your boundaries and stand up for yourself. Similar to self love, we must stand up for ourselves. We can not rely on others to fight our battles for us. It’s also important to not try to control others. The world is going through a major transformation, and so are you. Everyone on this earth is walking through the fires of rebirth in some way or another. In order for the Earth to be reborn, we must each walk through our own personal fires of transformation. Be sure to focus on your own path and don’t try to control the beliefs or paths of others. Despite the emotionally charged waters this month may have to offer, it can be a time for building lasting partnerships and strengthening our current bonds with our loved ones, alternatively, it can also be a time of uncovering what is no longer working, noticing red flags, and addressing them in order to build something lasting. The card pulled for this cycle is Play, a great reminder to try to remain light-hearted during these emotional times. Bring play into your day to day! Turn on a comedy while you cook dinner, or play around with something creative. Use play as a way to build habits this month. The New Moon is a great time for starting a new goal or habit and studies show that adding an aspect of play to learning or building a new habit can cut your habit building time down significantly. The act of playing while learning engages both sides of the brain, letting us create stronger connections and reinforces the habits we are trying to build. The First Quarter Moon takes place in the sign of Capricorn on the 16th of October. The First Quarter Moon holds energy of “ignition.” It’s a time where our desire to accomplish our goals is sparked. Capricorn lends us clear focus for our goals and ambitions during this time. So use this energy towards your advantage. Make a clear cut list of the things you want to accomplish and then get to work. Check in with your intentions from the New Moon and get started on an action plan. Taking some form of action now will be helpful in building the momentum you need. No matter how small the step may feel, take some form of action. The Card pulled for this cycle is Transform. We are still deep in the transformative process that this New Moon has offered us. Virgo is still retrograde in Scorpio and will be until Mid November, remember that you are unearthing a lot and transforming what you find daily. This is a great week for working some of your magick. Light a candle and perform a fire ritual this week. Burn a list of what you want to banish, and cleanse your home with the smoke of sage. The Full Moon takes place in Taurus on the 24th of October. This Full Moon marks the peak of the peak of the harvest season and acts as a harbinger of Winter’s chill. We will likely feel a shift in the weather around this time as well as an energetic shift as the Veil surrounding the Earth thins even more. The Full Moon is known as the Crone Moon, and sometimes the Dying Moon. This is a time when the veil is thin, wisdom from the ancients is available to us from the other side if we dare go within to find it. Don’t forget to check back here on the Full Moon for our monthly Full Moon Ceremony! Full Moons are also a time of celebration, fulfillment and harvest, so remember to enjoy these times! Go out and get yourself your favorite coffee and enjoy the fall season. Spend time in nature enjoying her death and rebirth process. Notice the leaves as they change color and appreciate her beauty. This Full Moon is in the earthy sign of Taurus, the lover of beauty and lavishness. Allow Mother Earth to heal you this week. The card pulled for this cycle is the Connect card. Connect to Gaia and the Moon this week if you are feeling emotionally drained. There is medicine in connecting to the natural world around you. Alternately, there may someone out there who could benefit from hearing from you this week. This week you might feel called to connect with those around you. The energy of this cycle is that of Taurus, the lover and healer, so listen to your intuition and reach out to those you feel called to. You never know how much you can help and heal others just by being there. The Last Quarter Moon takes place in the sunny and fiery sign of Leo on Samhain, October 31st. Leo loves to dress up and be center of attention, so this night should be an enjoyable one! Leo helps us express ourselves in an open and confident way, so allow yourself to express your inner true self tonight! The Last Quarter Moon holds energy of preparation and making room what is coming. After the celebration of Samhain, it’s important to tie up any loose ends you might see and prepare for the coming New Moon. Check in with your last New Moon intentions and make any needed adjustments, and take any steps you can to finish your goals. The card pulled for this cycle is Planting Moon: Preparation, a perfect card to pair with the energy of the Last quarter/waning moon cycle. It feels important to be in preparation mode this week. The New Moon takes place in Scorpio on November 9th, so we may be feeling some emotionally intense waters rising again. Prepare your home and environment for the coming New Moon by making your space safe and sacred. Be sure to cleanse your crystals and your deck under the New Moon tonight and set some intentions. Tonight is a powerful night for intention setting and magick making, so be sure to take advantage of this night! Don’t forget to check back here on the Full Moon for our monthly ritual! Subscribe to our Moon Tribe! Sign up with your email address to receive news and updates about the deck and future products! ...A moon cycle filled with magick, deep wisdom, and a cycle which asks you to stay receptive and open as the seasons wane. The Crone stirs you into her cauldron to be alchemized and transformed. This cycle is not for the faint of heart, and as it lands in the season of Scorpio this year... it will be more intense than ever. Keep in mind that there are many names for each Moon cycle, and some people may resonate with the Blood Moon, Beaver Moon, or other names, but we are staying true to our Spirit de la Lune deck, and resonate with the Crone Moon energy this cycle. We follow the moon and stay flexible to her ebb and flow! Uranus will be opposite both the New Moon and Venus during the Full Moon this cycle, so expect the unexpected. Remain open and flexible and have faith in your magick. This cycle I pulled a lot of reverse or tilted cards... so the energy is very topsy-turvy. Have faith that the Crone's cauldron will test you, but it won't be more than you can handle. Grab a warm brew and sit a spell, won't you? Let us begin. The New Moon in harmonious Libra will be disrupted by Uranus, creating twists and turns and will want to throw you off balance. But there is a method to this madness. Libran energy would rather focus on what creates more peace... which would be great, as long as it is not covering or masking a wound that needs to be seen. The card pulled for today is Waxing Crescent: Awareness. Tune in to your intuition and discernment now. The Crone Moon cycle will mostly be in Scorpio, so things will rise from the deep. Whatever is rising from the deep from within you right now, this is the key ingredient you need to throw in the cauldron to be transmuted. The external world is deep in this pot of unrest, injustice, fear, survival, and chaos. We are all feeling this to some degree... so we need to honor the deep emotions of rage, grief, despair, hunger, and yearning, that are surfacing for us. They need to be heard and felt within us, so we can begin to make shifts outward into the world around us. So what is surfacing for you? How can you bring more awareness to it, without judgment or shaming it? Do not cover it up. How can you honor these emotions and find peace with them? Whatever it is this New Moon, throw it into the cauldron and let the magick begin. The First Quarter in Aquarius (who by the way, is ruled by Uranus, there he is again! ), is a time to check in with the Water Bearer within you. Your air body (your mind) and water body (your emotions). Are they in alliance with each other right now? Is your rational mind leading, or are your emotions wreaking havoc? Or are they working together to serve you and the greater good? Continue to tune in with yourself. The card I pulled is Capricorn: The Achiever but in reverse... I felt really drawn to look into Capricorn further... remember this cycle is about going deeper. Get your hands dirty and dig deep into the soil of your terrain. I found that Pluto is still slowly moving through Capricorn right now until 2023. Pluto is the God of the Underworld, and in modern astrology ruler of Scorpio and we are in the Scorpio season! Of course we are reminded of this at this time. With Pluto in Capricorn, this is a push to find what is truly worthy of your time and energy. Be strategic with your precious energy right now... there is a lot going on, and you can better serve when you focus and direct your energy in an intense and intentional way, rather than in a scattered, multi-tasking sort of way. You will most likely feel drained and powerless if you put too much on your plate at one time. Pluto explores the use and misuse of power, and with Capricorn being the achiever and ambitious leader they are, what is fueling your desire for power? Is it controlling you? Are you using manipulation? Be open and honest with yourself. The Crone is supporting you in this. Most importantly what is your power that is unique to you, and how can you use it to serve the greater good? Throw this sacred ingredient into your cauldron. Did you hear that? The spirits are calling! I decided to pull a card for Halloween as well! On Samhain, the veils between realms is thin and we can tune into the spirit realm more easily than any other time in the year. This is a wonderful time to practice any type of divination to connect with your guides, Source, and your ancestors. Halloween also falls on a Waxing Gibbous in Pisces... the Psychic of the Zodiac... the energy in the cosmos is telling to you tap into your intuition and connect with the Divine! The card pulled is the Waning Gibbous: Listen, but tilted on its side. In order to listen to messages from other realms, we must be able to soften, and allow the messages to move through us. They will come to us in a way we can "hear" them. Some people feel them in their body, some hear voices, some see images flash before them. How does the Divine speak to you? And how can you prepare yourself to receive? If divination tools help, try scrying using water (perfect for watery Pisces), or read tea leaves, use your pendulum, or take out your own Spirit de la lune deck and try the Crone Moon reading in the guidebook. For many pagans and witches, Halloween is their New Year, so set new magickal intentions, celebrate, and connect into the different realms this night. Remember to have fun and invoke joy! When Taurus is in her fullness and prime... She reflects all the beauty, magick, power, and potential we all have within. A Taurus Full Moon is like Botticelli's Birth of Venus... all are enamored and drawn into the euphoria and beauty she creates. However, Uranus is opposite Venus, who happens to be the ruler of Taurus on the Full Moon, taking the personal energy of Taurus and making it trans-personal... This feels awkward to Taurus and Venus. Remember to expect the unexpected,possibly in your relationships and you may feel a disconnect in your own skin. Coming back into your body will help... move your body in a way that feels good today. The card pulled for this Full moon is Waning Gibbous: Reflection in reverse. The reflections of ourselves can be distorted at this time. You do not realize the impact you have on others. Whoever is in our lives, we chose each other to learn and grow from each other... we reflect to others what they need to see and hear and feel. Just as they do for us. People may be triggered by you today, and you may be oblivious and downright obstinate as to why (Stubborn as a bull, much? Or in this case, Taurus). Remember, we are always reflecting and sometimes projecting... which one is it for you right now? And if someone is triggering you, tap into the Taurus energy and check in with your body and the sensations it is telling you. What is this person reflecting to you? What in your life is being triggered? When this surfaces, you have an opportunity to shift it! The Crone once again is stirring and brewing you in her cauldron. Take these triggers and throw them in the cauldron. Or, do you feel completely vibrant and embodied today? Is Venus rising within you? Throw this into the cauldron as well. This cycle you are creating your own special brew with the Crone. The Full Moon ceremony we will be working with cauldron magick! Make sure to have a cauldron (fire proof container), some bay leaves, oils (carrier oil and essential oils of your choice), and an empty glass bottle, to work with! A Last Quarter in Leo finds us releasing parts of ourselves that no longer serve the greater good, or keep us in a state of being small. Leo wants you to shine forth, since Leo is ruled by the Sun and our own Sun signs hold the energy and the potential light we can shine in the world (regardless if we are Leo or not). The card pulled is once again in reverse. It is the Waning Gibbous: Dream. You maybe holding onto a version of yourself that is unrealistic or sets you up to fail. Don't get me wrong, dreams are beautiful and keep us growing and expanding on our paths, but the shadow side of a Leo last quarter moon is self-sabotage. And if we let our ego dictate our dreams and not our higher selves... we will always play it small and always keep it just out of reach. We are not meant to chase our dreams... we are meant to embody them! So what "dream" of yours, is keeping you small and always chasing? What dream fills you up completely that you explode in radiance? Embody the latter. If you are having nightmares, keep lepidolite and angelite on your nightstand or in your pillowcase. If you cannot activate or remember your dreams, place labradorite on your nightstand... it may make your dreams very vivid and keep you up though, FYI! Amethyst is an amazing dream time stone to work with... keep it close to you while you sleep! Use a dream journal to track your dreams and notice any patterns or themes. In the morning before you get out of bed, use rosemary oil and rub the oil into the bottoms of your feet and third-eye to remember your dreams more clearly and wake you up for the day! This Crone Moon Cycle is potent with possibility, transformation, and magick! We hope this report helps you prepare, and begin to gather your items for your Samhain celebrations and the Full Moon Cauldron ceremony! 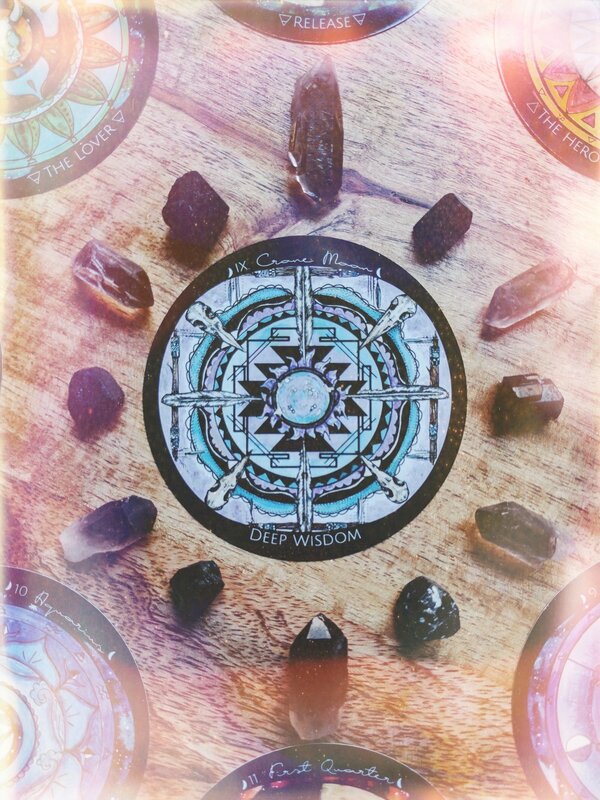 Take some time to set intentions, charge your crystals and cards, and share any pictures with us through instagram! Subscribe and join the Moon tribe! Sign up with your email address to receive news and updates about Spirit de la Lune decks and new and Full moon readings and ceremonies!. In the Northern hemisphere the days are growing darker and the realm of the Crone is upon us. The Crone is the Wise Woman, Shaman, Elder; she has danced as the maiden is Spring; she has bloomed as the fertile mother in Summer; she is the weaver of magick in Autumn. The November moon cycle honors her magic and presence. She reminds us that everything has a season, we can rest in the stillness of our wisdom, and her mystery and magic lives within each of us regardless of age. The cycle before us is potent with the elements of water, air, and earth. It is time to connect your body, emotions, and mind to the deep stirrings of the wisdom within you. Give voice to your truth, feel your truth deep in your bones, and move forward from this space. 10/29/16 is considered Lunar Samhain with the Dark Moon is Scorpio. The Dark Moon is the lowest energy of the Moon cycle before the New Moon and a new cycle begins. What can you lay to rest before moving forward? Ask your Crone. The card chosen for the overall energetic signature of the Crone moon cycle is the Blue Moon card Renewal. The hardest part is over. now it is time to turn inward and reflect on the lessons you moved through. During the Blood Moon cycle, your soul experienced a rebirth on some level and as you move into this moon cycle your soul needs to experience deep rejuvenation, inspiration, and renewal to integrate these new layers. You can do this by turning within. Integration requires stillness and your willingness to listen and receive. Listen for your inner truth. What values have shifted within you? Listen for the wisdom you have gained in this process. What seeds of wisdom have you received? Listen to your ancestors and your guides. How can they support you right now? Listen to the Crone, wise woman, within you. What does she want to say to you? In many cultures the wise woman is the keeper of the cauldron. The cauldron represents womb wisdom and the deep mysteries of the Divine feminine. The Crone invites you to stir the waters of your cauldron and peer within. During this cycle, focus on dropping into your womb regularly - breathe deeply into this space where your intuition resides. What mysteries do you hold in your womb? What desires lay hidden there? Soften into this space this cycle. Allow rejuvenation to enter into this space. Dive deeper into your yearnings and into your magic and remain open to what will be revealed to you. The New Moon in Scorpio is a moon of potent emotions and the waters within you are churning. Imagine your womb as a cauldron right now. How are the waters moving within it? Imagine the waters in your cauldron becoming still so you can see the reflection within. What would you see? The card pulled for this moon phase is the Waning Crescent: Rejuvenate. Again we dance with the themes of renewal, stillness, and rest. Set an intention this cycle to truly give your body, mind, and spirit the rest they need. This is so important to do before the holiday bustle. Peer into your cauldron and see how this would play out during the cycle. What do you see? What do you need to add to these waters to bring in peace and stillness. You may feel a resistance at first, as the moon in Scorpio brings up our fears, doubts, and our insecurities. There is so much shadow work within a Scorpio Moon so be gentle with yourself find compassion for your shadow. How does your shadow need to be acknowledged and supported this cycle? When you can look within the reflection of your cauldron without fear, but softness, you can then be still and slow down and let the rejuvenation begin. The gemstone, Ocean Jasper can help you soften into you womb space. As the moon begins to grow and we move toward the First Quarter moon on 11/7 in Aquarius. If you have been practicing rejuvenation and tapping into your womb space, you may begin to feel an expansion and your cauldron may be bubbling over with inspiration. The card pulled for this phase is the Honey Moon: Productivity. 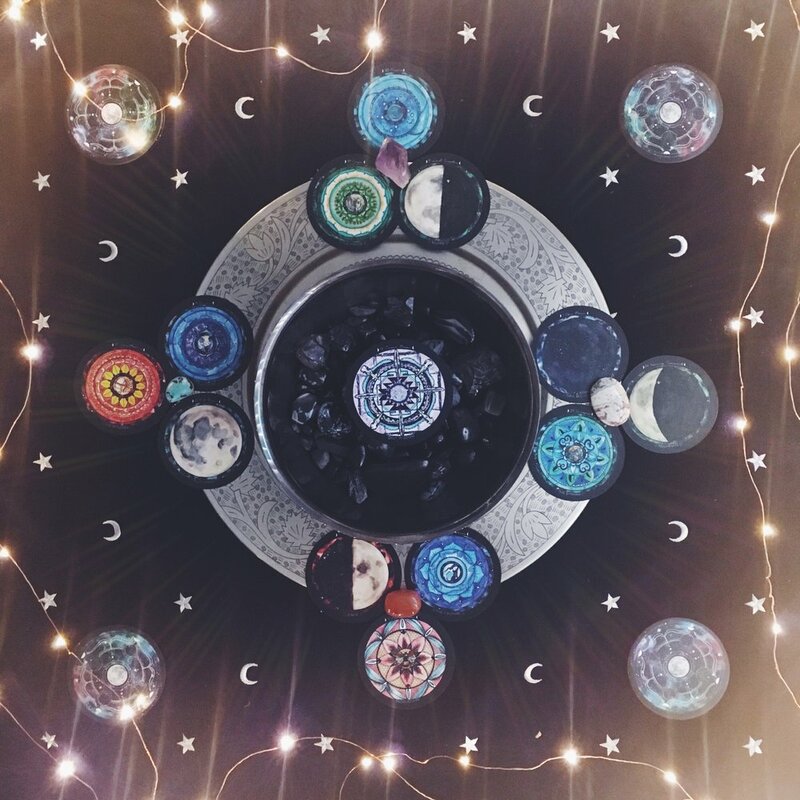 Reaching out to your tribe and moon sistars will keep you in the flow of your creativity and rejuvenation by directing your energy into collaboration and support through your community. You may feel a massive download of messages and wisdom coming in at this point so let it flow through you. Automatic writing will help you tap into this well of inspiration and find those seeds of wisdom you are seeking. Just know, the more you resist seeking support, the more taxing it will be on your mind body and spirit. Allow the Aquarian energy to pique your curiosity and shift your perspective. The cauldron has been ignited and the waters are heating up within you creating momentum and guidance in your new direction. An alchemy is beginning to brew so move with this current and see where this takes you! Carnelian will help you to deepen into your womb and your creative flow. As we reach the full moon we meet the twins in Gemini. They hold the wisdom of your truth and help you to listen and to speak from this sacred place within you. The card pulled for this full moon is Sagittarius: the Explorer. When a zodiac sign is pulled in a Spirit de la Lune reading it can represent a person you know or the archetype within you that needs to be activated at this time. Sometimes it can be really hard to express your truth or your creativity, so ignite the explorer within you and see this as a new adventure to embark on. Have fun exploring your words and expressing your creativity and don't let insecurities or fear keep you from this experience. Imagine the crone within you stirring the cauldron of wisdom reciting incantations over this magical brew you are creating. Create a spell or blessing or affirmation for this Full moon using your voice, your words, and your magic. Speak them aloud creating the vibrations with your voice. These vibrations bring your desires and truth closer to manifesting in the physical realm and integrates them into your body. Speaking your truth and listening to others express theirs, keeps your vitality flowing and brings peace to your spirit. Wear Turquoise around your neck to aid the actualization of your authentic voice and wisdom. As the moon begins her descent, the last quarter moon settles you into the realm of Virgo: the Healer. The Crone feels at home here. This is a very grounding and earthy moon phase and is a wonderful time to work with the earth energies of plants and stones to aid your rejuvenation. Remember to adapt and move with the currents - not everything can be controlled. The card chosen for this phase is Pisces: the Psychic. Take the time to ground yourself and listen to your intuition from a place of deep stability and stillness. Allow the wisdom from your cauldron to wash over you and help you reflect on all that you have learned this cycle. The Pisces realm is a deep ocean of dreams, the subconsciousness, empathy and intuition. Let yourself float into these waters and allow the Piscean energy to bring in a deeper level of renewal. The brew you have made within your cauldron is ready to be taken in. During the waning phase, you can literally make a healing brew of herbs in a cauldron or create your own Piscean cauldron in your bathtub mixing any herbs and salts and your affirmations into the water and soak this magic into your cells. Be intentional with the energy you put into the water, the brew, your words. Place Amethyst in your tea or bathtub and drink in the wisdom. We hope you enjoyed this reading and that your Crone Moon cycle brings you closer to your magick and wisdom. Spirit de la Lune Updates! We are excited to announce we are beginning to ship pre-sale orders next week! We are so excited to finally have the decks back in our hands so very soon! Thank you so much for all your love and patience! You can still order the second edition! We have created 2017 Spirit de la Lune wall calendars! Two versions are available: Full Moondalas & Zodiac Moondalas! At the moment we are only offering Northern Hemisphere calendars and limited supply. These will be available to purchase on Nov. 8th!